Any medical or graduate student who studied in the Taubman Medical Library from 1980 to 2013 may remember it as a silent, windowless, slightly musty-smelling, but distraction-free zone. A new generation of students is about to make its own memories in the same building. Only it’s much different today. 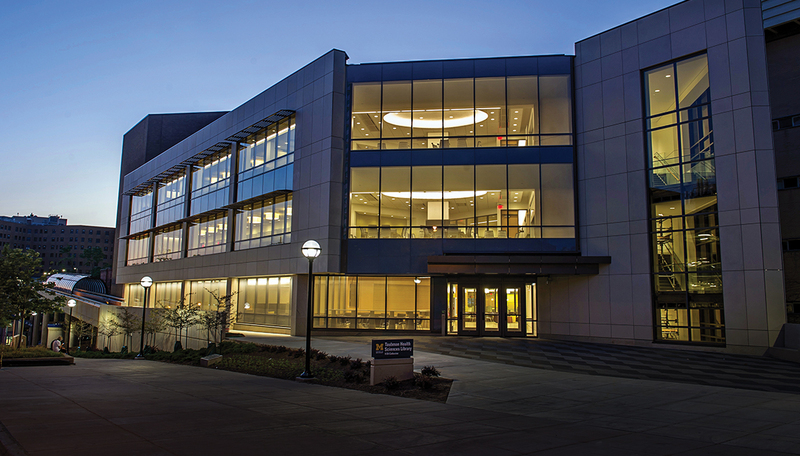 In August, the library emerged from a two-year, $55 million metamorphosis, just in time for the arrival of the new medical student class and ahead of the 2015-16 academic year for the rest of U-M’s biomedical and health science graduate students. Gone is the all-brick exterior, replaced by tens of thousands of feet of glass. The exterior walls transform the view of the building from Catherine Street and let in light that might once have damaged the books. But those books are gone. Most of them — 519,000 in all — have moved to an off-campus location but are available in both digital and physical form on demand with help from specialized health sciences library faculty called informationists. The most historic medical tomes, some dating back centuries, have joined U-M’s special collections on the central campus. Gone, too, are the dim corridors, worn carpets and dated furniture. In their place are modern workstations for students to study and collaborate: a giant touchscreen digital table for exploring anatomy virtually; walls and tables that students can write on with whiteboard markers; and colorful, comfortable gathering spaces. Medical students now have 30 modern exam rooms fully equipped to help them hone their clinical skills, and the “standardized patients” they examine now have their own area to prepare for their roles. Removing physical books, and the bulky shelves holding them, freed up two floors for classrooms, computer labs and small group rooms. These were all designed specifically to support the new curriculum that began phasing in with this year’s entering class. The Taubman Health Sciences Library, as it is now called, also houses resources for health and biomedical science students from all areas of the university. Renovations also included improved lecture halls and meeting spaces on the second floor for graduate students. Dedicated space throughout the building will help these students learn side-by-side in new inter-professional courses that emulate clinical teams of nurses, doctors, pharmacists, dentists, social workers and public health professionals. Much of the building’s lowest level is devoted to learning and advising space for the Medical School’s graduate students and postdoctoral fellows. It opens onto a courtyard surrounded by the medical science research buildings, where many of them work. A new café, a kitchen in the large new medical student lounge and even a few spaces to grab a nap, will support the 24/7 demands of student life. A monumental staircase added to the southeast side of the building provides a dramatic view of the medical campus through glass walls, and wide “Main Street” corridors on each level make navigation, and chance meetings, easier. The building’s namesake, A. Alfred Taubman, gave the naming gift for the original building in 1977, and drew on his architecture training and experience to advise on the renovation before his death early this year.